Dr Sharifa Noaman al-Emadi, left, speaking at the panel discussion at the UN in New York. The Doha International Family Institute (Difi), a member of Qatar Foundation (QF), has hosted a panel titled ‘Gender-Responsive Social Protection for Adolescent Girls to Enable Aspirations and Reach the SDGs in the Arab Region’ on the sidelines of the 63rd session of the Commission on the Status of Women, currently taking place at the United Nations (UN) headquarters in New York. The panel, held in partnership with the Qatar Permanent Mission at the UN, the UN International Children’s Emergency Fund (Unicef), and the Arab Institute for Women at the Lebanese American University, was a continuation of Difi’s study on ‘Family Sensitive Social Protection’ and Difi’s expert meeting held in Doha last year. It aimed to further the discussion on current models of welfare and protection systems in the Arab region with specific focus on adolescent girls, shedding light on protection systems in terms of the extent to which they respond to adolescent girls’ practical and strategic needs and tackle issues related limited autonomy, lack of voice, and agency. 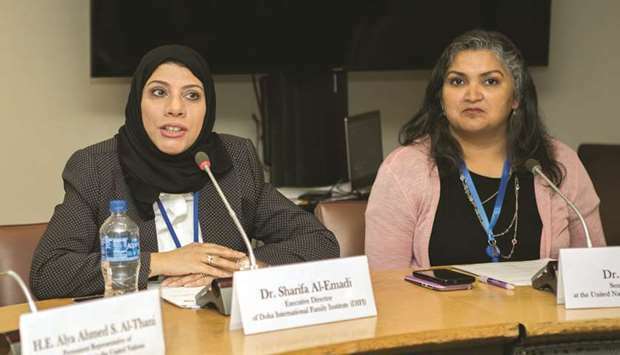 Dr Sharifa Noaman al-Emadi, executive director, Difi, said, “Evidence shows that social protection programmes can strengthen the capacity of families to care for their adolescent girls in an optimal manner if provided with the needed means and resources. Therefore, fostering knowledge on Arab families and advancing family policies and programmes through evidence-based policies, research, and advocacy are the main objectives of Difi.